This is another example of a slow painting. If you’ve followed my blog, you know that I like to paint en plein air. The challenge of turning out a speedy painting in a couple of hours is fun. However, some of my best work is when I create a studio painting which may take weeks or more. This blue bowl of sunflower and zinnias presented its own challenges. If you’ve ever painted live sunflowers, then you know that they keep up their rhythm of turning towards the sun. This means every time you return to the studio, the darn flowers have rearranged themselves! This is an oil on a toned canvas. I spent about a week and a half on this painting. I don’t know if the painting is actually done but I’m finished working on it. The flowers were in pretty sad shape by the time I finished. I like the careful attention to detail but it is a real trick to not overwork a painting. It should look effortless for best effect. In my opinion. 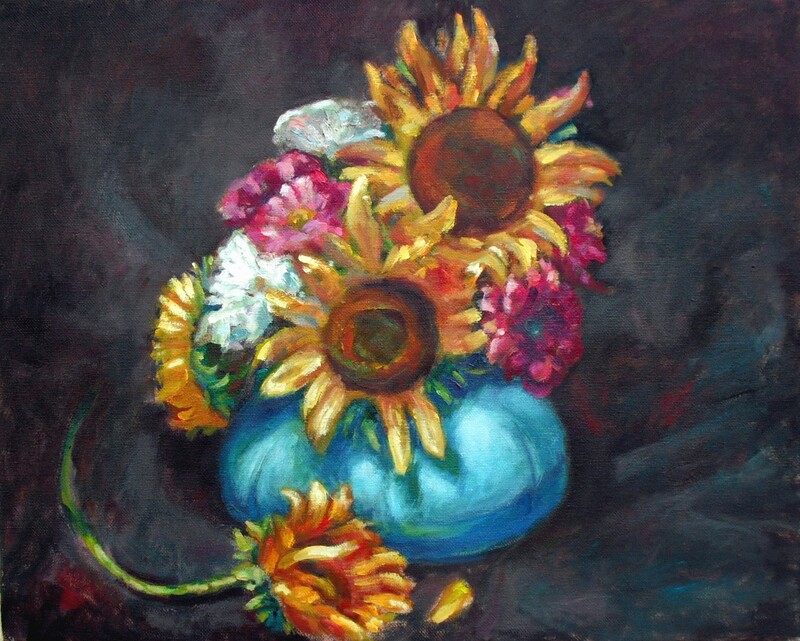 This entry was posted in art, oil painting, still life and tagged kit miracle, oil painting, sunflowers, toned canvas, weller pottery. Bookmark the permalink.